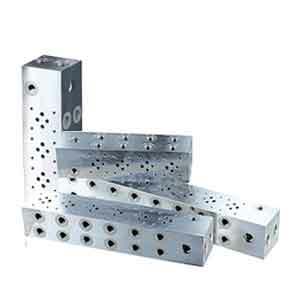 Characteristics: For large quantity manufacturing, reducing manufacture hours and increasing efficiency, especially for standardized pattern valve blocks. 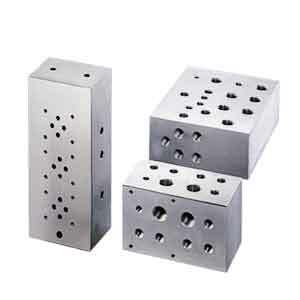 Characteristics: Our standard material for manifold blocks, with medium strength, good corrosion resistance, weldability, good oxidation effect. With good flatness. 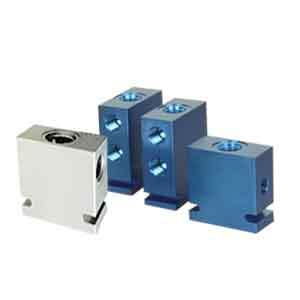 Improve processing efficiency and reduce material costs. This will be the best choice for low price, high quality materials for hydraulics. Characteristics: The best strength of aluminum alloy is 7075 alloy, its strength can be similar to medium carbon steel, but it can’t be welded, and its corrosion resistance is good enough and price is higher than 6061. Characteristics: With high strength and good machinability, after appropriate heat treatment can obtain a certain toughness, plasticity and wear resistance, the source of the material is convenient, with good overall mechanical properties. The initial thickness of the valve block is set to be 5 times of the maximum diameter of the valve port, then gradually reduced according to the specific requirement. 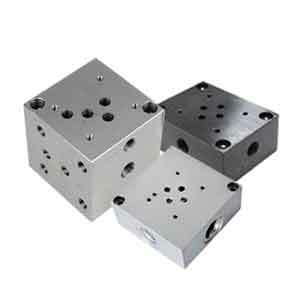 The deep, inclined and process holes must be as less as possible, the large flow chamber should be taken into account first, and then is the pilot chamber. Safety wall thickness between the oil chamber shall not be less than 3~5mm, and the deflection of the drill within the allowable range shall be considered. The flow rate of hydraulic oil in the chamber should not be higher than 12m/s, and the oil return chamber should be 20-40% larger than the inlet chamber. Mining Machinery- Forestry Machines – Construction Machinery – Quarrying Machinery – Mining Machines – Agriculture Machinery – Waste & Recycling Equipment – Materials Handling Industry And Other More Industries.